Yes the same question is coming up over and over again but we are still wondering what we should do about climate change and a not-so-good-looking future. On a personal level, being green takes many assets but efforts often look like a drop in the sea. How about the professional level? As an architect, can I do more than I do as a citizen, urbanite, householder ? Does implementing a sustainable practice and designing green buildings will change anything at all? To adress the challenge, the Center for architecture invited three different architects at the Seaport Culture District to talk about their unconventional practice. About a year after I first heard about TerreformOne (see The future of design panel and TerreformOne exclusive interview), I am up for an update on the lab’s work. Mitchell talked about their work at the Brooklyn Navy Yard. He told us about the wet lab they built with bio-hackers to work with actual biologic entities, and how they literally built organic architecture in the making of the Bio City map of 11 Billion (see below). He told us about the smart city, that is different from the green suburbs where houses are living structures that will reconnect us with nature. The MATscape is a panelized version of this living habitat. Then, everyone’s jaw dropped when he presented the Urban farm pod, that grows food on top of looking super cool (see below). And in case a disaster happens, TerreformOne has plans for a cricket shelter that is a harvest for food. Cricket flour potentially contains an enormous amount of proteins. But the lab also works on bigger scale projects. One of their Urbaneering project – Governors Hook – is to reconnect Red Hook and Governors Island. Another, related to other designers and projects, is to consider waste as a resource with Rapid Re(f)use. The Statue of Liberty is outlined with the amount of trash produced in NY City in an hour. After many years of practice as an architect, Pat got more and more concerned about climate change, became an environmental activist and finally shifted her career to swim in the Green Tech pool. She now runs cleantech initiatives at the Urban Future Lab. To combat climate change, Urban Future Lab uses three tools: academia, policy conversation, and business innovation. For the latter, their incubator hosts start-ups that are more about new business models than new technologies. Take the energy grid for instance; there is currently no relationship whatsoever between customers and providers. We need more options and the possibility of choice for energy access and grid distribution. Pat tells how “her” firms are working on solar services, passive house materials supply, transport efficiency, energy data use, and so on. Amanda Lehman, from COOKFOX architects and William D. Browning, from Terrapin Bright Green LLC. Cookfox is a more conventional practice, with a strong interest in green technologies. Through their partnership with Terrapin, a consultant firm focusing on large scale net zero projects and biomimicry, they deal with a larger spectrum of sustainable design. The impact of green building on the well-being of people gets measured. The goal is to bring nature into architecture, using 14 patterns organized in three categories: nature in the space (visually or directly), natural analogues (like fractals), nature of the space (like refuge). 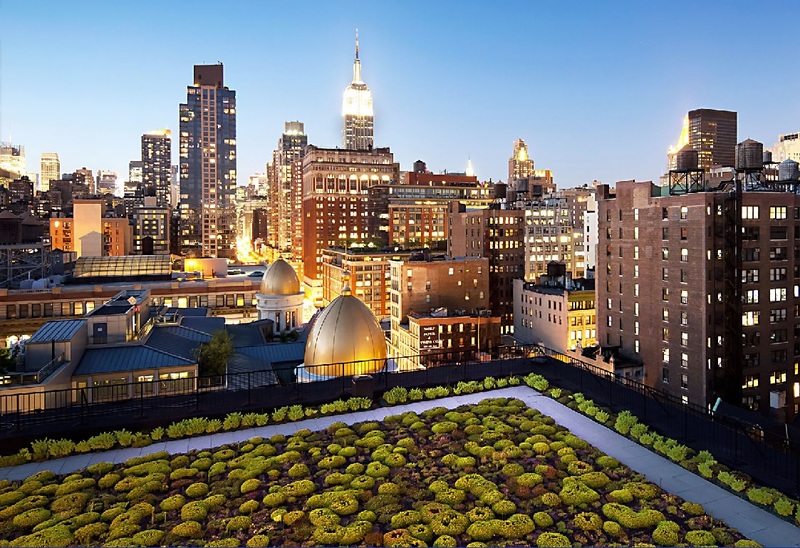 At their shared office located at 641 6th ave, Cookfox and Terrapin designed and built themselves a green rooftop, which rapidly became more than a decorative feature but really an opportunity for every employee to connect with an eco-system. The post-occupancy survey showed how important was that green roof. Cookfox is now moving out to relocate midtown in the Fisk Building. It took them a while to find that new space; they needed that green roof! Amanda describes how the design of the new office includes everything they learned from their previous location. Namely, there are going to be views, outdoor refuge spaces but also indoor refuge spaces with nooks. This is biophilia in action. The host asked the speakers to share their experience as architects in their different practice. Pat was the only architect among MBA holders in the clean energy counselling industry. She had a design thinking that is critical to the field. Mitchell worked for IM Pei within a more conventional environment, for F. Gehry who builds movement itself and for Moshe Safdie who is more concerned about sustainability (but whose more recent bread-and-butter projects are… nah…). In his multidisciplinary practice, his architectural background gives Mitchell a mindset turned towards innovation, change, new ideas. But what we want to do is to communicate ideas to Mr Simpson, to the average American. In our world, that is an on-going Charette according to William, technology and education are hand in hand. Amanda tells how LEED is for her practice a list to check but also a tool to help the team to design sustainable buildings. With all the data and scientific study that we have, we are often discouraged and pessimistic. Are we doomed? wonders the host. Pat reminds us to look at the enormous progress we made for the past century, all fields alike. She thinks we will be able to design our way out of this problem. Quoting JF Kennedy (talking about nuclear bombs): If men created this problem, men can solve it; Mitchell says that design is a very powerful tool. We architects can build convincing detail narratives. Like it happened during the first spatial explorations, a few people’s imagination inspired everyone. But this is going to take all of us, there will be no credit to a specific group or nation. As for William, he shows how we know much more today than we ever knew, we have a much better input for analysis, namely about our building stock. Things are happening faster than we expected, and this could be true for climate too. According to the drawdown movement, if we stop every greenhouse emission to get back to the levels of the pre-industrial era, the planet would stabilize in two decades. An attendee is asking for their recommendations. What should we do? Pat advises us to start with information. We should know passive house standards and make our buildings smart and energy efficient. Look it up, it is usually common sense! Mitch talks about the Masdar Project in Abu Dabhi (see below), designed by N. Foster. This experimental city implements a lot of environmental systems and sustainable notions. To William, the important thing we should focus on is to make buildings that people like and care about. Energy is just a small cost of the building. For the roof of 6th avenue, office workers made a shift from considering the roof a decorative feature to see it as an eco-system by itself. The roof engaged the team and changed relationship people had with space. We should seek for elements of design that connect us to a place, and that is what big companies like Google are also interested in. When asked about green roof, Amanda explains that it is now easier to install than it was before. People now see the advantages of water retention, insulation, etc. What they installed themselves at 641 6th avenue (see below) is a system of light weight bags. They were able to move them easily when the roof membrane was to replace. The only resistance might come from building manager and owner, and it can be overcome with education. In Singapore, a law is now asking for a minimum ratio of 1:1 of green growing surface per building footprint. In NY, incentives with Floor Area reduction are going towards this direction. The power used to light the US outdoors at night is reported to waste 30% due simply to poor light direction which equates to 21 million tons of carbon dioxide per year and that is just the US. Yet, very few communities have any regulations to create dark skies and stave off this obvious climate damage.